We often find ourselves entwined in career prospects that do not lead to any conclusions. But then there are people like Samir Kazi who just land themselves in situation from where there is no looking back. From store assistance to managing a multimillion-dollar company, Samir has surely tasted the success that many dream. During the initial days of his career, Samir did not have any desire to become an entrepreneur. He was just doing a casual search on his computer one day that kindled the entrepreneur inside him. Four years down the line, he is heading one of the flourishing businesses in E-Commerce sector. Gadgetbucket.in is one of India’s premier online shopping portals offering a host of products from a range of categories including computer accessories, mobile accessories, kitchen appliances, home décor and many more. 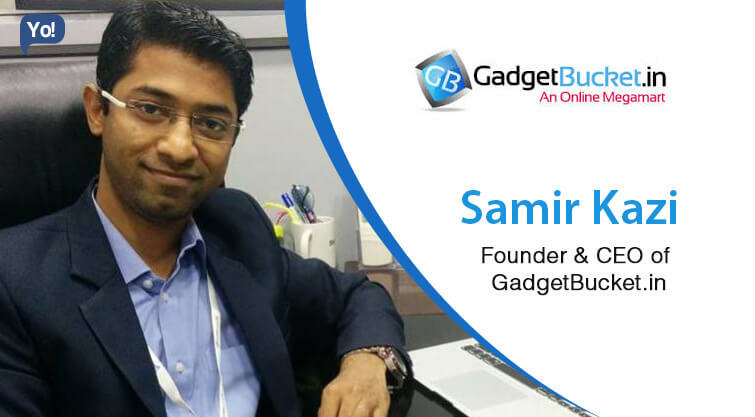 With more than 1.5 lakh customers on his platform, Samir surely has hit the top gear when it comes to ecommerce industry. I was a frequent online buyer, one day tried to sell something, and now still selling. I just want to grow, profitability is secondary, i believe if i grow money will come automatically. To Convince the family that i am quitting my job and starting my own business. Challenges should be there else you cannot learn, there are many examples where we stuck in something and overcome with that. Initially had very difficult phase as i didnt had any money for doing business, than i sold my apartment which i bought just for the investment purpose, i got good profit in that which i invested in my company. Being an employee for more than 10 years I completely aware that what an employee expect from the employer, hence we always try to achieve the employees expectations, we have fun at work, events celebrations, Biannual Increments, growth etc help us to retain our employees. There are many more, but i think these three are very important. I am into e commerce business so we are most relay on google analytics to check the traffic on the site and visit trends etc, apart from this we have to be focus on marketing, digital marketing such as facebook, google adwords, mail chimp etc. As per me discipline is the key of success this habit makes you more productive. To become a successful we need to believe in our self, if we doubt our self than we will not be able to get success. Always ready with your plan B, no one knows when the plan A fails, remember if you fail than it means you are for the bigger opportunity not for this ;). Always believe in yourself, not much depend on others, if you depended than have a strong follo. We are planning to launch a Teleshopping site and channel. I am learn from the mistakes, and i will continue doing the same, i will learn will my mistakes which i did and try to avoid. “Keep Doing The Good Work, Good will Happen To You”.